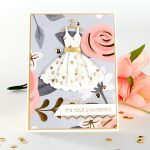 Hello friends, I am very excited about the Art Deco Collection by Spellbinder® Licensed Designer Stacey Caron! They make such a statement and are so dramatic. But can also be used with a soft palette as you will see in this tutorial. One thing is certain, your project will be timeless and elegant. 1. Cut/Emboss one (1) S6-059 Art Deco Fairmont Decorative Accents Large Frame Die using Whirl White paper. 2. Cut the S6-059 Art Deco Fairmont Decorative Accents Die Cut down the middle – as shown above. 3. Overlap the cut edges, lining up the peaks of the two Arches. 4. Adhere using double sided tape as shown above. 5 Adhere to precut card base using Pixie Play card and 3D Foam tape. 6. Cut/emboss one (1) S6-075 Art Deco Astoria Decorative Accents Accent Die using Whirl White cardstock. 7. Cut/emboss one (1) S6-075 Art Deco Astoria Decorative Accents Frame Die using Pixie Play. 8. 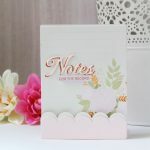 Layer the Inner Frame Die Cut onto the layered card base using 3D Foam Squares. Art Deco Astoria Decorative Accents Inner Frame Die Cut using liquid glue. 10. Adhere double sheer Bow, secured with a pearl brad to the left side of the small frame using liquid glue. 11. Adhere a baby bling to each corner of the small frame. Thank you so much for stopping by and the comments you leave us. We do appreciate your encouragement and support. 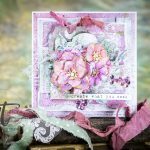 Don’t forget to pop by Spellbinders® Facebook page to say hello and share your projects created using your SpellbindersÂ® products.